Recently I was at Haneda airport in the new international terminal. To get from the gate to the plane, not only did passengers need to go out on a jetway, but we also needed to go down a flight of stairs to get to that jetway. Well, being slightly lazy, I took the elevator. Here is a photo of the elevator buttons. 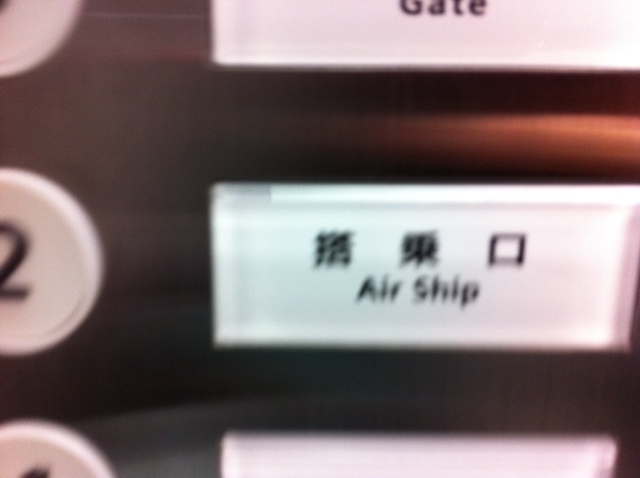 The 3rd floor is for the gate but the 2nd floor is not for the plane, but for the air ship. What an apropos metaphor. Air BUS might be the best description for the cattle-car method of traveling we all use these days, but for now, air ship will do it. If anyone would like to give me a direct read on the associated Kanji symbols, that would be great. In the meantime, I hope you get a giggle! It’s danged fuzzy, but it looks like 搭乗口, which I think reads as toujouku, meaning something like “embarkation gate.” The door you board the plane through.